More than a year and a half ago, I introduced you to the Student Success Game, which is a gamified rubric that you can use to help your students reflect on their own behavior, and provide some external motivation to encourage them to improve said behavior. I should have done this earlier in the year, but in March, I pulled out the game and tried it with my classes to try to curb some ongoing misbehavior. I introduced the game to students in all my core classes, even though only one class was causing the majority of problems. I offered up chocolate and/or Dum Dums as the prize, with students scoring the most points winning the first round. Winners of the second round will include those who score the most points and those who make the most improvement. Here’s the kicker: Scores are based on the points students give themselves. In order to earn those points though, the teacher has to agree with their self-assessment. This gives me the opportunity to talk with the student one-on-one about their behavior. 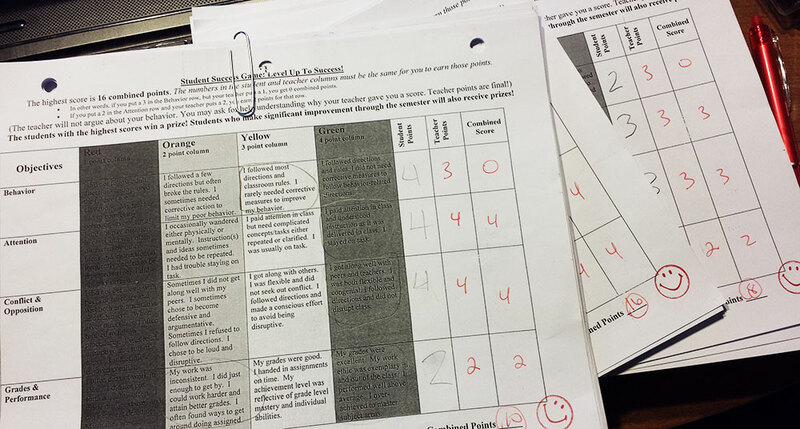 Regardless of whether I ask the student to lower or raise their points in a specific category, their overall points will increase. These students are mostly well-behaved. As with anyone, they have their moments, but overall, they listen to instruction, are receiving good grades, and respond respectfully when I redirect them. As an example, a small body of existing research, as well as anecdotal knowledge, indicate that classes with a high proportion of children who have difficulty regulating themselves, paying attention, or who are not prepared to make the transition to formal schooling, present a challenge to teachers and their peers. In this classroom, child behavior may be influenced directly through modeling and social learning. Additionally, such a classroom likely affects students indirectly as teachers spend disproportionately more time managing behavior or academic issues, resulting in less time devoted to normative grade-level instruction. Note that this does not say that the teacher lacks classroom management skills, or that her lessons are less than spectacular. Rather, the problem is that some children “have difficulty regulating themselves, paying attention, or who are not prepared to make the transition to formal schooling.” Some children, for whatever reason, retain this difficulty well in to middle school. As I went over the game sheets at home, I noticed that all but one student had been fairly honest in their assessment of themselves. In other words, I didn’t have any students give themselves a 4 when they clearly earned a 1. For the most part, if students were off, it was by just one point. On the following Monday (we completed the game sheet on a Friday), I called each student to my desk during an independent working time and talked to them about their answers. If I agreed with their assessment, I just showed them their scores. If they scored in the 13-16 range, I game them a high 5. 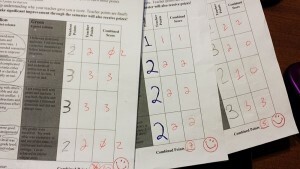 On the other hand, if I disagreed with the student assessment, I showed them their original score, reviewed with them what they chose, and the score I chose for them on that row. Then I asked them why they thought I’d disagreed. In every case, the student acknowledged that I was right and agreed to change their score without any argument. The nice thing about my system is that their agreement with me automatically raised their overall score, even though they lowered the number in the Student Points column. Surprisingly, when I talked to those students who have consistently misbehaved in class — including those who were getting in trouble in all of their classes and who had been suspended on one or more occasions during the year — they acknowledged that their behavior had been poor. (It helped that I had these students turn away from the class as they talked to me, so that they were not trying to perform for the class.) They also agreed that they are valuable and smart and capable of doing so much better! These students also agreed that they would try to raise their score by the next time we played the game. 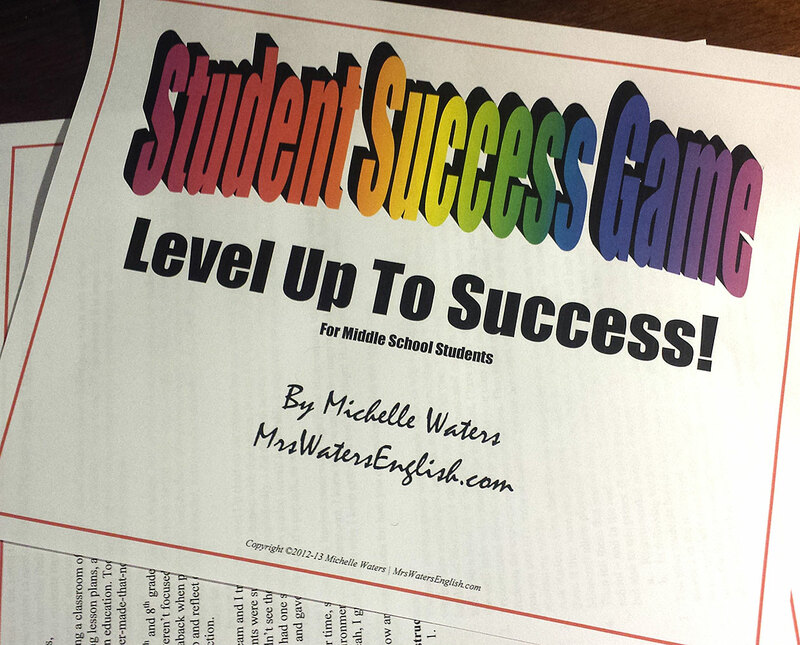 I noticed over time that my classes started to behave better after we played this game. Now, I just need to start using this game much earlier in the year — perhaps after the first month of school, when they honeymoon phase really starts to wear off! If you’d like to give this game a try, you can download it in my store.